The price of sizes for 11 and 12 years old girls is increased by 20%. Our model is 122 cm. tall. We accept custom size orders, please leave us a message with your girl’s measures in the comment field before purchasing your product. Asymmetric black leather and silk tunic - Perforated leather top- Long sleeves- Boat neckline- Skull printed silk fabric Washing instructions: Delicate Program recommended Composition: 100% polyester The price of sizes for 11 and 12 years old girls is increased by 20%. 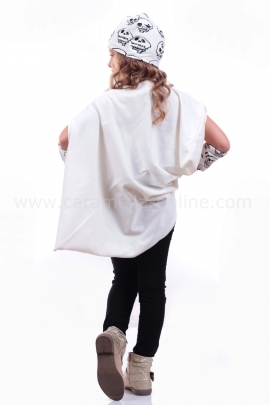 White asymmetric loose tunic -Detachable skull print sleeves -Boat neckline Washing instructions: Delicate Program recommendedComposition : 100% cottonATTENTION!The price of sizes for 11 and 12 years old girls is increased by 20%. Asymmetric yellow braided neck tunic- Asymmetric hem- Waist black rope closure- Long sleevesWashing instructions: Delicate Program recommended Composition - 95% cotton, 5% elastaneThe price of sizes for 11 and 12 years old girls is increased by 20%.